Some of Ireland's most beloved recipes, such Irish Soda Bread and Irish Stew, can easily be adapted to gluten-free recipes. Combine one or more of these dishes with some gluten-free beer, and you'll have a St. Patrick's Day to remember. 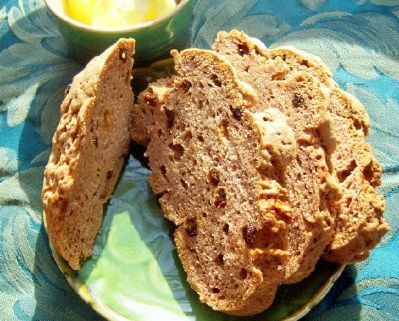 This recipe makes a light, classic loaf of Irish soda bread that has terrific flavor and texture. This is a dairy-free recipe, but it is also delicious when served with Kerry Gold butter—the rich, deep yellow creamery butter from Ireland. Kerry Gold butter is well worth seeking out. This recipe is called Tattie Scones or Potato Scones in Scotland, while in Ireland, it's called Fadge or Potato Bread. But whatever you call this dish, these little potato rolls are easy to make, economical, and a good use for leftover mashed potatoes. Fadge can be baked or pan-fried. While the recipe is dairy-free as well as gluten-free, for anyone who tolerates dairy, these potato rolls are delicious served with butter. Ireland's national dish is Irish stew. A traditional Irish stew was always made with mutton, but more often nowadays, is made with lamb. Controversy reigns over whether vegetables other than potatoes should be added; adding onions, leeks and carrots not only adds extra flavor but also nutrition to the stew. The choice is yours. This recipe calls for flour, so make sure to substitute an appropriate gluten-free flour when making it for guests with restricted dietary needs. Sweet rice flour, for example, works very well. This stew will be delicious to everyone, not just those with special dietary needs. A classic recipe for Irish corned beef and cabbage, with carrots, onion, turnips and of course potatoes, this is a favorite St. Patrick's Day dinner recipe. This well-seasoned recipe is gluten-free and absolutely delectable! What better to serve alongside a warm slice of gluten-free and dairy-free Irish soda bread or gluten-free barm brack than a warm, cheery bowl of gluten-free creamy potato leek soup? This recipe can be adapted to dairy free-diets as well—perfect for celebrating St. Patrick's Day if you're not only gluten-free but dairy- free too! Champ, like Colcannon, is another way of using potatoes either from fresh or as a way to use up leftover ones. ​This Irish champ recipe shows just how easy it is to make from scratch. This recipe could not be easier, utilizing only potatoes, onions, milk, butter, and seasonings.